Comparing numbers can be difficult. Young mathematicians, especially in kindergarten, just become proficient in learning the quantity of numbers before diving into comparing those numbers. For decades, teachers have relied on the 'ole alligator analogy for teaching students to compare numbers and draw comparison symbols. 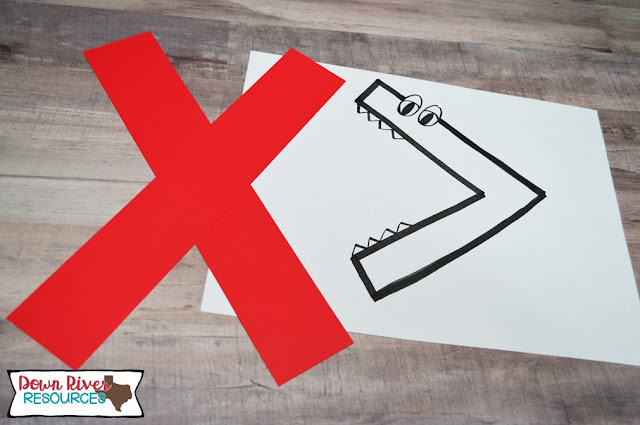 You will find numerous blog posts and printables with this cute alligator, even suggesting to use him with decimals and percentages. Have you or your students become dependent on drawing teeth on comparison symbols? Students think, "Is the bigger value eating the smaller one?" or "Is it the value it already chopped on?" This becomes confusing, especially for younger students. While this can be a cute anchor chart, students are not internalizing the meaning of the comparison symbols. This misnomer is confusing children and frustrating their future teachers. I know what you are thinking, if the alligator analogy isn't the best for students to learn, what can I teach my students so they can retain the correct meaning for these symbols? Read more to find a strategy for teaching comparing numbers and correctly explaining comparison symbols. Thinking about how a child learns vocabulary, it's easy to roll back time and reflect on how a young child learns their name. How does a child learn their name? Parents have identified the child by their name. The parents and others around the child use their name in context. With repeated exposure to their name, the young child memorizes it. Soon they are able to repeat their name and identify themselves as such. Children are innately logical and literal. If we say "alligator," children think of the lizard-like swamp animal, not a mathematical symbol. If adults call a comparison symbol an "alligator," we are mislabeling a content-specific word for students. I truly believe this is what happened in my early education. I learned tricks in school, not actual mathematics. Eventually, there comes a point when tricks no longer suffice for students and can lead to failure in advanced mathematics, which is the WHY behind everything I do with Down River Resources. 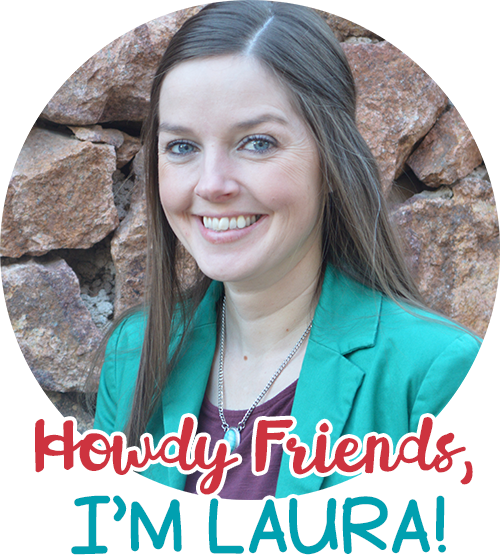 There is a big movement, especially in upper elementary, middle, and high schools to break students away from these misrepresentations. Trust me, I know it is not ANYONE'S intention to teach incorrectly, often times, we are victims of our own education. Educators teach the way they were taught unless they have since learned differently. How Do I Teach Comparisons? Kaila and Marco were born on the same day. Kaila has 9 birthday candles on her cake. Marco has 7 candles on her birthday cake. Use a comparsion symbol (>, <, or =) to compare 9 and 7. Ideally, with exposure to symbols, such as in the word problem above, students memorize the meaning. Just as students hear comparative language, such as "equal to," "greater than," and "less than," they need to see the symbols that represent these phrases too. After modeling this language and its corresponding symbols, the students should practice saying and writing them too! If you are still stuck on the alligator so the students have a scaffold for learning the comparison symbol, I have a strategy to help. Sometimes before students can internalize the meaning of the symbol, it helps to actually analyze the shape of the comparison symbol. Think about an equal symbol. Now, let's take a closer look at the symbols that represent inequalities. The segments, or bars, are tilted when using the inequalities. There is a smaller side and a larger sides. The GREATER number is next to the wider end, while the LESSER number is next to the narrower end. As students move into advanced mathematics, students will need to apply this skill to integers. Calling -6 'bigger' than -16 creates confusion for students. As you can see below, EVERY grade level focuses on comparisons to some degree. Let's commit to focus on teaching mathematics, not just the tricks! - TEKS K.2G Compare sets of objects up to at least 20 in each set using comparative language. - TEKS K.2H Use comparative language to describe two numbers up to 20 presented as written numerals. - TEKS 1.2D Generate a number that is greater than or less than a given whole number up to 120. - TEKS 1.2E Use place value to compare whole numbers up to 120 using comparative language. - TEKS 1.2F Order whole numbers up to 120 using place value and open number lines. - TEKS 1.2G Represent the comparison of two numbers to 100 using the symbols >, <, or =. - TEKS 2.2C Generate a number that is greater than or less than a given whole number up to 1,200. - TEKS 2.2D Use place value to compare and order whole numbers up to 1,200 using comparative language, numbers, and symbols (>, <, or =). - TEKS 3.2D Compare and order whole numbers up to 100,000 and represent comparisons using the symbols >, <, or =. - TEKS 4.2 Compare and order whole numbers to 1,000,000,000 and represent comparisons using the symbols >, <, or =. - TEKS 4.3D Compare two fractions with different numerators and different denominators and represent the comparison using the symbols >, =, or <. - TEKS 5.2B Compare and order two decimals to thousandths and represent comparisons using the symbols >, <, or =. 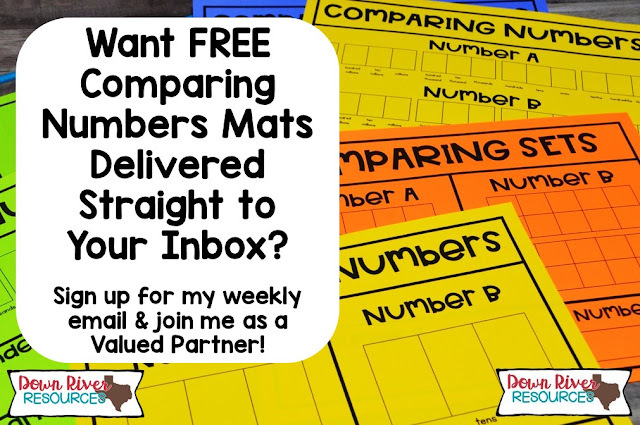 I hope this post inspires you to use math language when teaching students how to compare numbers, if you want to download some free mats to use when comparing numbers, you can find them here. Were you taught the alligator analogy?